Earlier this evening, a man was photographed climbing the glass Olympic Cauldron at Jack Poole Plaza and upon reaching the pinnacle of the central burner witnesses saw him lighting a flare. The photos indicate the man might have been attempting to perform a ‘mock’ relighting of the Olympic Cauldron, the most visually strong legacy of Vancouver 2010. He also appeared to be standing inside one of the four icicle burners that support the central burner. Following the 2010 Games, a reflective pool was built at the base of the Olympic Cauldron as one of the security measures to prevent damage to the glass. In addition, motion sensors along the circumference of the pool and a CCTV camera below the central burner were also installed. This follows two other similar stunts over the past few months which involved climbing the 60-foot tall EAST VAN sign, located at Great Northern Way and Clark Drive, and Library Square’s “The Words Don’t Fit The Picture” sign. In both incidents, the climber also lit a flare when he reached the top of both signs. It also comes after the social media storm on Wednesday, February 12 that criticized public authorities for not lighting the Olympic Cauldron over the duration of Sochi 2014. Complaints stirred after some locals realized that Calgary and Montreal had rekindled their flames beginning last week for Sochi 2014. February 12 marked the four year anniversary to the Opening Ceremony of Vancouver 2010, when Wayne Gretzky was transported from BC Place to Jack Poole Plaza to light the main Olympic Cauldron. By mid-afternoon on Wednesday, B.C. Transportation Minister Todd Stone scrapped the ‘original plans’ to light the flame on the last day of the Games – that the Olympic Cauldron would instead be relit at 8 p.m. later that night for a duration of 2 hours. 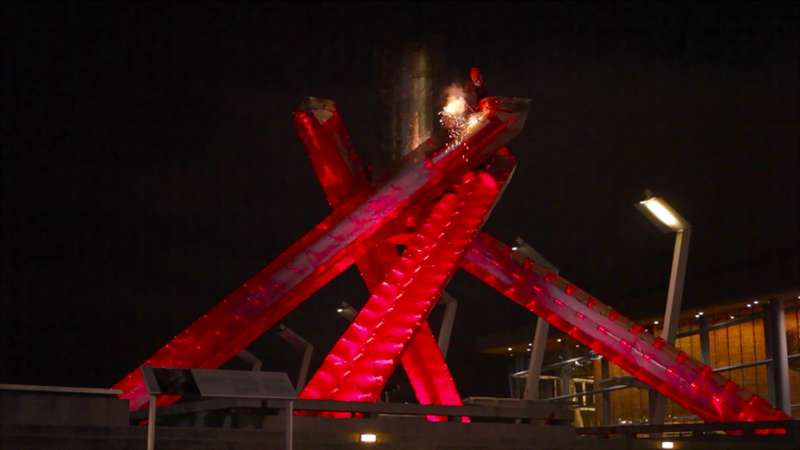 A pair of anonymous private donors have also paid to have the Olympic Cauldron relit each evening at 6 p.m. on days when Canada wins a gold medal in Sochi. It costs approximately $6,400 to relight the Olympic Cauldron for a minimum period of four hours. The Sochi 2014 Olympics conclude on Sunday, February 23.